Whatever will harm Australia that we are against. 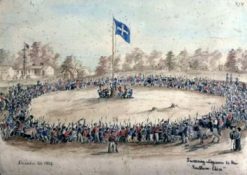 The Australia First Party advances Australian Identity, Freedom, and Independence, in contrast to the Globalist/Internationalist policies of the current holders of the State Power in Australia. Australia First provides an alternative to continuing servitude to Global Capitalism, and places the national interests of Australians and Australia first. Our vision is that of a High Culture, fulfilling the aspirations passed down to present day Australians from our pioneering and settling peoples for a new European derived civilisation, wherein our citizens productively participate, and attain both the highest quality, and enjoyment from life, commensurate with sustainability from our available resources. Australia Firsters see our great old continent, with its unique eco-systems, as more than just a quarry, a people dumping ground, or for exploitation by corporate interests parroting materialism and consumerism. On the issues of strategic Australian manufacturing capacity/self-sufficiency, foreign ownership, ecological sustainability, big business immigration and/or community destroying multiculturalism, what the prevailing traitor class advocates is against the interests of Australians, and is undermining our civilisation. Their globalist doctrines will see the Australian People perish. The Australia First Party is committed to a regime change from this traitor class, and offers a beacon for men and women to step forward, and to join in this challenge. If you don't fight you lose!